1. Metro – is one of the principal modes of urban passenger transport. Being underground train system, it is related to aggravated risk for passengers and requires special attention and precaution. 2. These guidelines are designated to ensure the security of transportation, improve passenger services and are binding for all persons within the metro territory. The territory contains overground entrance halls with surroundings, underground halls with under street passages, escalators, passenger moving walkways (travellators), central halls and station platforms, passways, underpasses, tunnels, ventilation shafts, underground railway carriages, depot and power substations. The open and closing admission hours of metro stations and deadline for line interchange is specified in informational signposts of every station vestibule. 3. 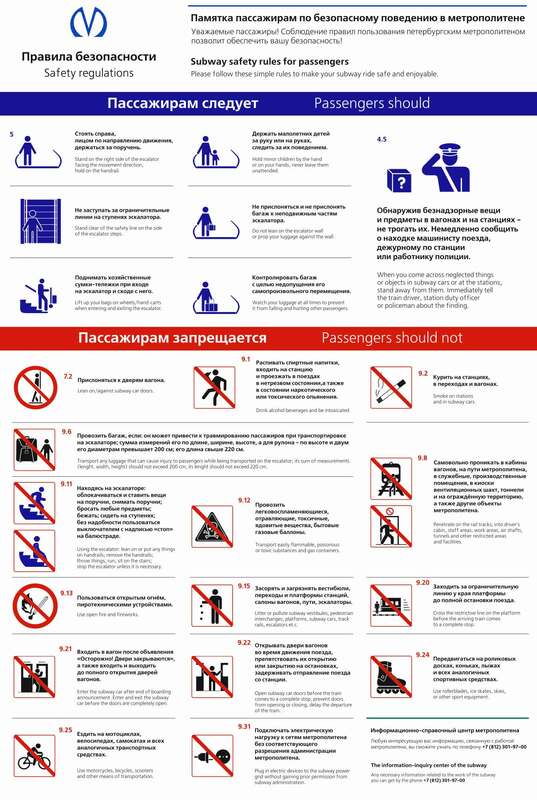 Passengers and metro staff shall be polite with each other, careful with constructions and equipment of metro, keep the area clean and maintain public order, and comply with the requirements of these Guidelines. 4.1.2. for transportation of every luggage piece, if its size (total length, width and height measurements) is within the limits of 121 - 200 sm, or lengthy objects (which one side length shall be from 151 sm to 220 sm, and the measurements of two other sides shall not exceed 30 sm). Luggage shall be appropriately packed, bunched, fixed the way to avoid possible injures to passengers. 4-1. To ensure safety of passengers according to Federal Law on Transport Safety, passengers, luggage, as well as carry-on items are subject to inspection. Passengers with implant medical devices are inspected manually, without use of special technical tools. These persons shall provide medical certificate and inform the conducting inspection metro staff worker about contradictions for inspection with special technical tools. Persons, refused to be inspected, are not allowed to transport safety zone. Passenger refusal to be inspected to ensure transport safety shall be grounds for unilateral termination of transportation agreement by the metro. 4.2. Access escalators (platforms) through the turnstiles with revolving gears. passengers with children until seven years old. Also, leaf turnstiles are designated for priority passage of persons with disabilities, pregnant women and the elderly upon presentation of effective travel pass documents. 4.3. Immediately inform station duty officer about fall of people or objects on station tracks. 4.4. In case of fire or any smoke, or any other factors, that may affect transport and driving safety, to immediately inform station duty officer or train driver via "passenger-driver" intercommunication. 4.5. If abandoned objects and carry-on items are observed in carriages and at stations, to immediately report train driver via "passenger-driver" intercommunication, station duty officer or police department officer, without taking any independent actions to remove them. control their luggage to avoid its self-movement. make room around the carriage doors for free exit of passengers when a train stops. prepare to leave a carriage upon arrival to the station of destination. bring free of charge guide-dog (with a muzzle, on a leash and with a special identification marking), accompanying sight-impaired person, upon possession of a document, confirming completion of training course for metro passengers with a limited vision, accompanied by guide-dogs. 9.1. Drink alcohol, enter stations and go on train intoxicated with alcohol, drugs and under the influence of other intoxicants. 9.2. Smoke in stations, in passes and carriages. 9.3. Enter station with ice cream, as well as with luggage or in clothes, which may stain passengers, carriages, constructions and equipment. 9.4. Enter and be in a station without shoes. 9.5. Pass leaf turnstiles with effective travel pass documents by way of electronic carrier, with travel passes and documents, giving no right to travel by metro, including copies of effective travel pass documents, as well notarized copies, using token-substitutes and implementing unauthorized passage through turnstiles with rotary mechanism, boundaries and cable ropes. 9.6. Transport bulky luggage with total measurements of length, width, height, and of length and two its diameters or axis at the baseline for round bails exceeding 200 sm, and which length exceeds 220 sm, as well as any other luggage, which may result in injury of passengers while transporting by escalators, moving walkways (travellators) (lino, roofing material, wire gauze in round bails, heavy metal profiles and bicycles (except for folded and sheathed) etc.). if a trolley-bag construction contains a supporting yoke, it shall be equipped with minimum two ball chocks and cylinder over the entire length with outer diameter not less than 20 mm. 9.8. Penetrate carriages, tracks, official and industrial premises, ventilation shafts, tunnels and fenced area, as well as other metro objects unwarranted. 9.9. Damage buildings, constructions, carriages equipment, escalators, moving walkways (travellators) and stations. 9.10. Enter non-working escalator, moving walkway (travellator) without a permission. 9.11. Lean and place items on handrails of escalators, moving walkways (travellators), move banisters, drop any things, run along escalators, moving walkways (travellators), seat on stairs of escalators, moving walkways (travellators), use unnecessarily "Stop" button at the balustrade of escalators, moving walkways (travellators). 9.12. Transport flammable, poisonous, toxic, contaminating substances, agents and liquids, household gas containers. 9.13. Use open fire, pyrotechnics (fireworks, crackers etc.). 9.14. Transport firearms, sharps and fragile objects, skis and ice-skating shoes unsheathed or unpacked, as well as animals without special containers, which size is subject to paragraph 4.1.2. 9.15. Litter and pollute halls, station platforms, carriages, tracks, escalators, moving walkways (travellators). 9.16. Throw any objects on tracks of the metro. 9.17. Take photos and video with a flash without written consent of the metro Administration. 9.18. Apply messages in vestibule, passes, and carriages. 9.19. Run along platforms, against the direction of motion, indicated by informational signposts, and hinder organized passenger flows. 9.20. Overstep boundary at the edge of a platform until the full stop of a train and after the start of its movement. 9.21. Enter a carriage after a call "Please, stand clear of the closing doors! ", as well as enter/exit before carriage doors are full open. 9.22. Open carriage doors on the move of a train, preventing them to be opened or closed at the stops, delay train departure from a station, open automatic fixed-site doors in closed-type stations, prevent these to be opened or closed. 9.23. Use "passenger-driver" carriage intercommunication without need. 9.24. Move on roller: boards, skates, skis and other equivalent sport tools within metro territory. 9.25. Ride motorbikes, bicycles, scooters ant other equivalent means of transport. 9.26. Listen to audio materials by loudspeakers, use sound reinforcement equipment and play musical instruments. 9.27. Enter a train after a special warning about proceeding further without passengers. 9.28. Use metro territory for commercial, advertising and other related to income-generating activities, as well as charity initiatives without a written consent of metro the Administration. 9.29. Conduct advocacy activity addressed to unlimited range of persons. 9.30. Burn garbage and build fires closer than 25 meters from all metro objects, including free-standing ventilation shafts kiosks. 9.31. Connect loads to metro network without related permission of the metro Administration. 9.33. Use privileged personal travel passes, owned by other individuals during passage through turnstiles, except for passage of individuals, assisting disabled children, sight-impaired persons of group I and II, disabled persons with both legs and(or) arms lost, with paraplegia or pamplegia, or without arm or leg. 9.34. Leave luggage and personal belongings unattended. 9.35. Disturb passengers with buy, exchange or fortunetelling proposals. 9.36. Be engaged in beggary. Violation of these Guidelines will result in imposing penalties according to current legislation. Inflictor, upon receipt of a citation, if it is impossible to remedy a breach on a spot, is removed from the metro territory. The removal is conducted by Metro Police department officers (St. Petersburg) of the Main Department of the Ministry for the Internal Affairs of the Russian Federation for the City of St. Petersburg and Leningrad Region, and by metro staff workers in force of professional duties. Approved by Order of the Transport Committee of St. Petersburg Administration on 29.06.1998, No. 233 (As amended by the Transport Committee on 07.02.2001 under No. 18-r, 16.02.2001, No. 23-r; 24.10.2005, No. 153-r; 24.07.2009, No. 139-r; 21.01.2010, No. 22-r; 26.05.2011, No. 43-r; 28.12.2011, No. 116-r; 29.08.2013, No. 100-r; 03.06.2015, No. 99-r; 26.01.2017, No. 8-r; 06.07.2017 No. 107-r; от 28.03.2018 No. 42-r; 11.05.2018 No. 77-r).